Tag Heuer is known for designing great luxury watches with specialized functions to best suit the customers need. While most TAG Heuer collections are designed for specific activities like racing or diving, the average working man isn’t overlooked. 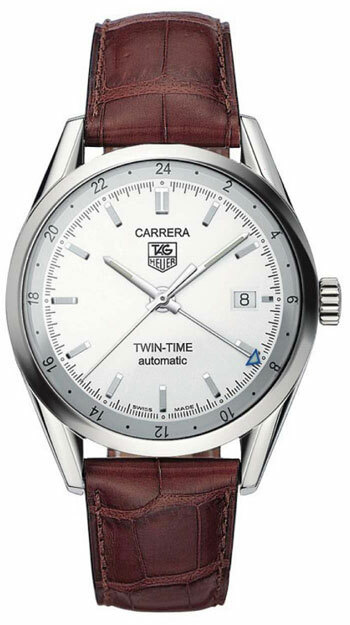 The TAG Heuer Carrera Twin Time watch for men is distinct in style and is intended for the traveling man. The white and silver dial stands out from the leather of the bracelet. A watch dial rimmed with 24-hour indicators– both numerical and baton. Silver hour, minute and second hands plus an additional time-zone hand. A stainless steel case with crown and sapphire crystal plating. 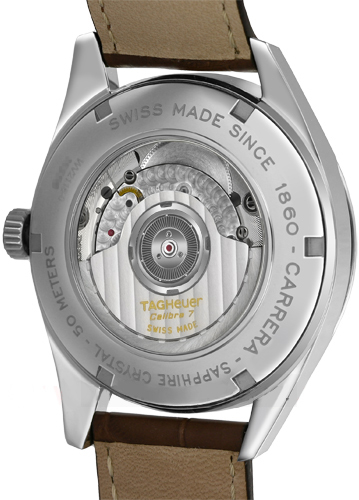 A Swiss automatic movement rotor. The Carrera WV2116.FC6181 is designed to be taken everywhere, most suited for those who constantly travel for either business or pleasure. One primary feature of this watch is keeping time of multiple time-zones. The additional time-zone hand is outlined with blue extremities and can be set independently so you can always keep track of the time at home, no matter where you are in the world. One function that proves this watch is intended for travel is the automatic movement rotor. The weighted pendulum in the back is meant to wind the mechanism while it is in motion. The casual swaying of the wrist while you walk automatically winds the movement, storing up to 7 days of reliable time keeping. With as many airport terminals and train stations you may pass through on your travels, this watch is bound to stay reliably wound. If you do happen to have it off for longer than a few days, a few quick twists of the crown and the watch will be back up to speed. This clear view of the rotor makes it easily accessed but potentially vulnerable to damage. The watch dial also includes luminescent markings for high visibility in low light areas. Also included is a date aperture at the six o’clock position along the 24-hour circumference. The bracelet is made from genuine alligator hide and is fixed by a deployment buckle, which greatly extends the life of the leather. Though it may be versatile, the Carrera Twin Time isn’t as durable as other performance watches. The clear back casing allows for a skeleton view of the rotor, but leaves it structurally exposed to extreme handling, so it may instead be wise to rely on your friends watch if you ever decide to go mountain climbing. Likewise the WV2116.FC6181 is only water proof up to 100ft so don’t expect it to survive if you take a dip while visiting the local beaches. Being able to track multiple time zones and automatically winding with regular use, this watch may very well be worth the price for any traveler. Luxury watches of this caliber are often expensive, the retail value of this on being set at $2,700, but can also be found at discount prices from dealers at a more affordable $1,900 or less. For a watch that keeps up with a bustling lifestyle, the Carrera WV2116.FC6181 is a reliable timepiece that hits the mark.